Home / Freebies / Enter Manilla Get it Together Sweepstakes for a Chance at $2500! Enter Manilla Get it Together Sweepstakes for a Chance at $2500! If getting your finances in order has been on your agenda this year, Manilla is a great resource! And for a limited time you can Enter the Manilla Get It Together Challenge for a chance to win the I Got It Together $2,500 Grand Prize and shopping sprees at Pottery Barn, Sports Authority, and Ann Taylor to help get your life together. To enter, you can sign up for Manilla (It’s FREE!) and link 3 accounts. Then you will be automatically entered to win up to $2500! 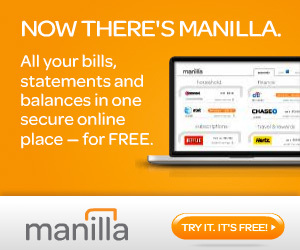 Manilla is an online tool that provides one place to manage all their household accounts and services, including bills, banks, credit cards, daily deals, subscriptions, travel reward programs & MORE! Once you are signed up you can get text and email reminders to pay bills, renew subscriptions, manage your daily deals among other things. This tool really sounds like you have your own personal admin helping you out. I know just keeping track of all of my daily deal vouchers and when they expire is enough to get me to sign up! Nothing worse than realizing the great deal you scored on an online voucher just expired last week! So head over to sign up for Manilla and give it a try. You have a chance at that $2500 grand prize plus those shopping sprees would be lots of fun! Free Playtex Sample of Gentle Glide Tampons! FREE Chocolate Recipes Cookbook for Valentines Day!